Sonia Sotelo gets ready for bed at All Saints' Episcopal Church in Highland Park on Tuesday night, Dec. 22, 2015. Every night until March, the church is opening their pews for people to sleep. 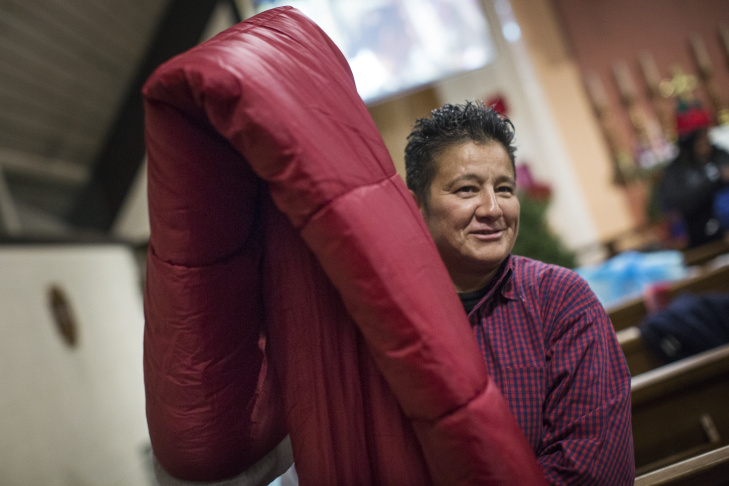 Zonia Sotelo lays out her sleeping bag at All Saints' Episcopal Church in Highland Park on Tuesday night, Dec. 22, 2015. 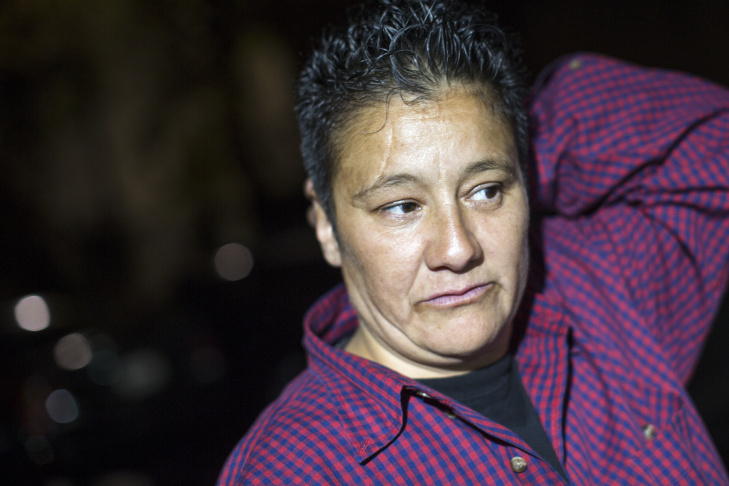 Sotelo lost her home in Pasadena at the beginning of 2015. She hopes to get a new place with her son soon. All Saints' Episcopal Church in Highland Park is currently taking in about 30 people a night to sleep in church pews. 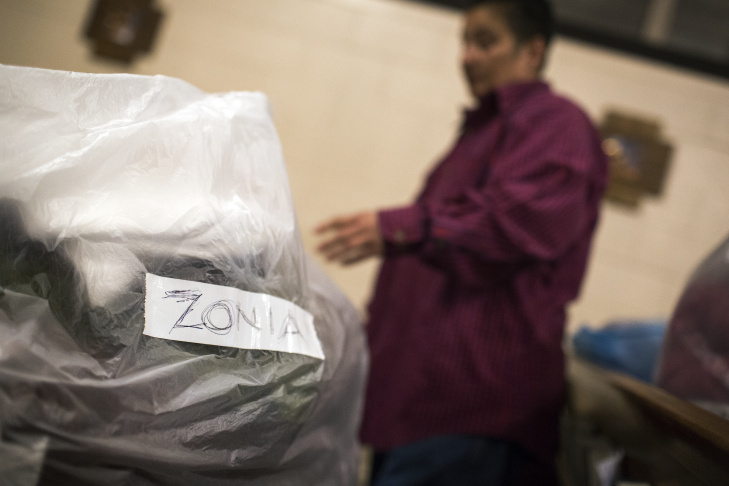 As Los Angeles' homelessness crisis worsens, local churches are stepping up their outreach. Sonia Sotelo gets ready for bed at All Saints' Episcopal Church in Highland Park on Tuesday night, Dec. 22, 2015. 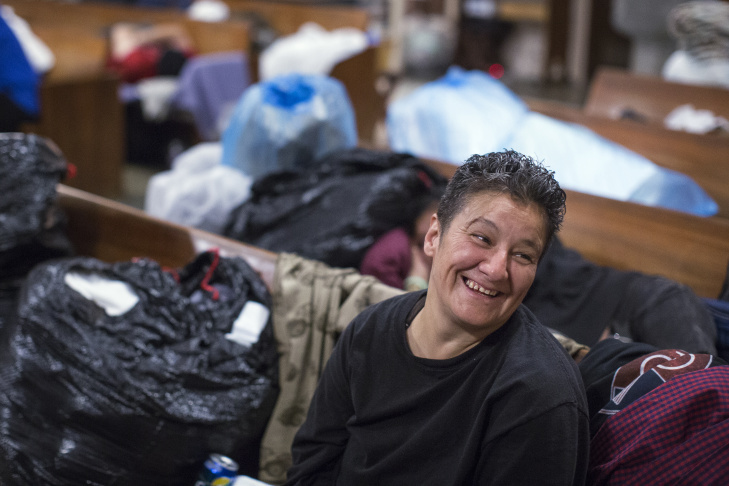 The church first opened its doors to homeless at the start of December. Monica Alcaraz is president of the Historic Highland Park Neighborhood Council. Alcaraz co-launched the winter center at All Saints' Episcopal Church. Elizabeth Montecino, left, and Zonia Sotelo eat dinner at All Saints' Episcopal Church in Highland Park on Tuesday night, Dec. 22, 2015. Montecino and Sotelo have been friends for about 10 months. 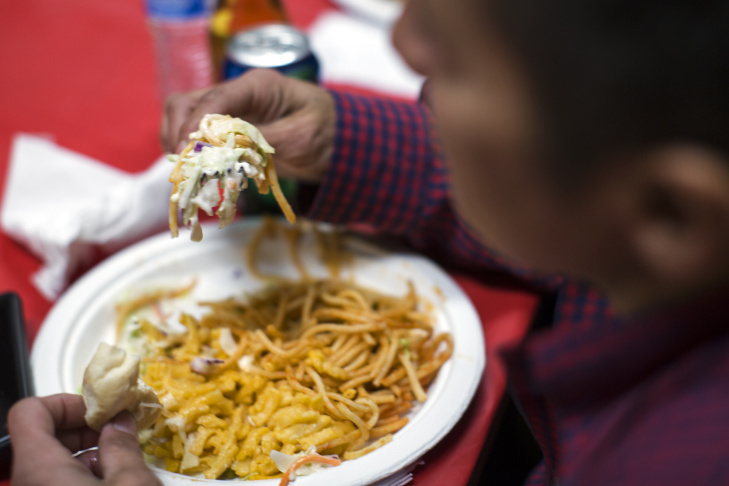 Zonia Sotelo eats dinner at All Saints' Episcopal Church in Highland Park on Tuesday night, Dec. 22, 2015. 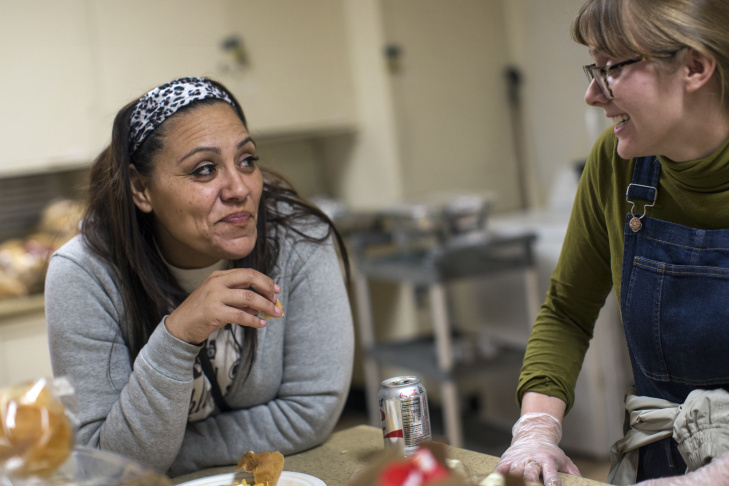 Churches are doing other types of homeless outreach beyond the typical food pantries and utility bill assistance. Zonia Sotelo stays overnight at All Saints' Episcopal Church in Highland Park on Tuesday night, Dec. 22, 2015. Sotelo is originally from Southern California and spent much of her youth in the juvenile justice system. Organizer Monica Alcaraz hopes that eventually the program at All Saints' Episcopal Church in Highland Park will get funding from the city. Sonia Sotelo gets ready for bed at All Saints' Episcopal Church in Highland Park on Tuesday night, Dec. 22, 2015. 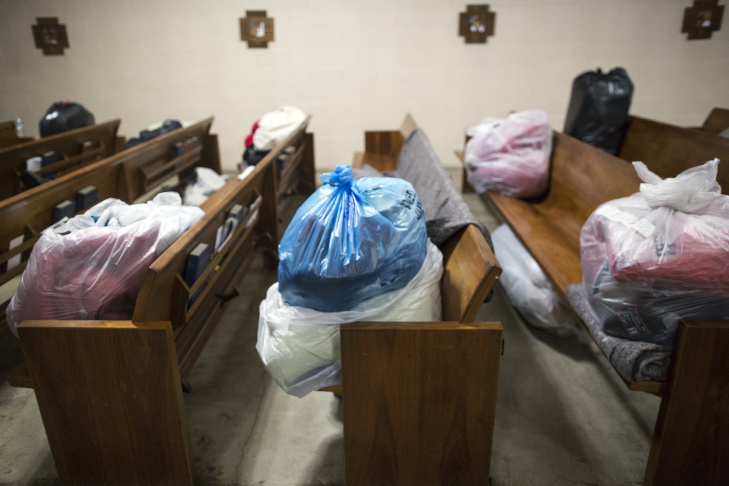 Those who sleep at All Saints' Episcopal Church in Highland Park each night leave their blankets, sleeping bags and pillows at the church during the day. Those sleeping inside All Saints' Episcopal Church in Highland Park leave each morning at 6 a.m.
By day, All Saints' Episcopal Church in Highland Park is a place of worship. 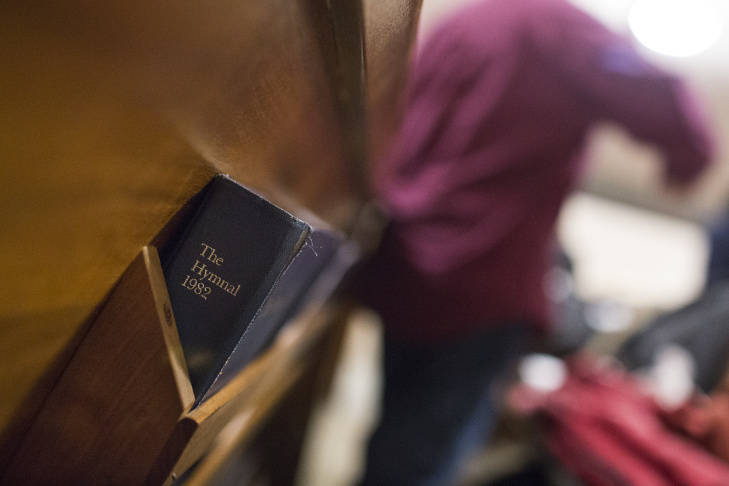 By night, it’s where dozens of people come to sleep under dimmed lights, in the wooden pews. 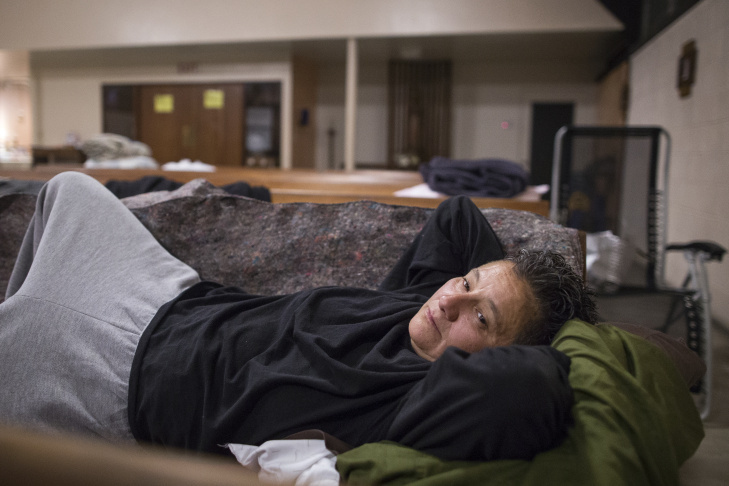 "I lay right down here, " Zonia Sotelo, 46, said pointing to a pew she's lined with a sleeping bag and blankets. "I sleep comfortable." 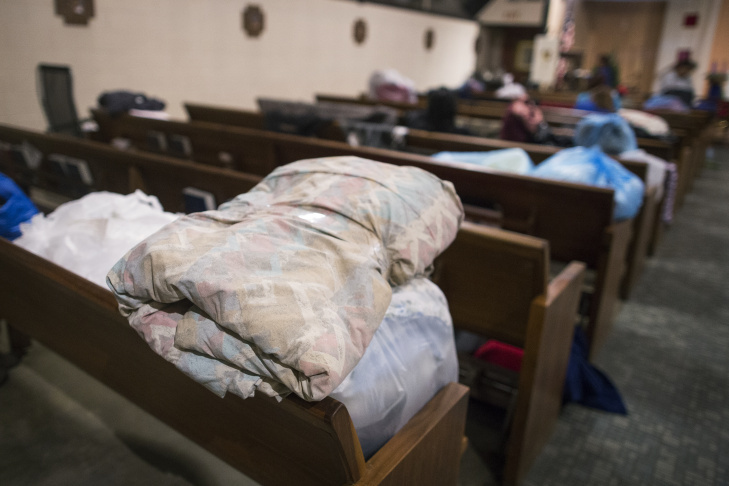 It's an unorthodox model, but All Saints' is on the leading edge of an effort in Los Angeles this winter to find beds for the country’s largest unsheltered homeless population- more than 17,600 people living on the streets, in riverbeds, in cars. The head of Union Rescue Mission on Downtown L.A.'s Skid Row is looking for armories and warehouses to shelter hundreds of people this winter. It's part of a coalition of about 30 non-profits called the Alliance to Solve Homelessness in LA which said it has contacted about 300 places of worship to see if they would open their doors as All Saints' has. The urgency around opening shelters is a shift away from the focus of recent years: long-term housing for homeless people. In L.A., government officials and non-profits have poured millions of dollars towards moving people into permanent homes. "Permanent housing is the only thing that ends homelessness," Christine Margiotta, founder of the Home for Good program at United Way–LA told KPCC's Take Two last month. As funding is directed more toward long-term housing, it's dried up for temporary housing, leading to a drop in available beds. But advocates say the level of L.A.'s homeless crisis, and coming storm season make ad-hoc shelter spaces like All Saints' necessary. About 30 people have been sleeping at the church since it opened its doors Dec. 1 and they can count on staying there through March. Sotelo said she appreciates the warmth and food, and even how the pews separate her from other people when she's resting. 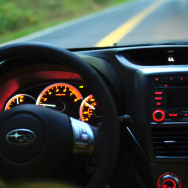 "I suffer from trust issues," Sotelo said. "If I don’t feel safe, I won’t sleep at all. I’ll just walk all night." 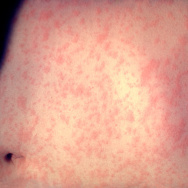 But local officials have been skeptical. 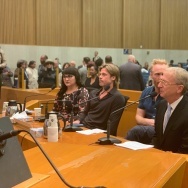 L.A.’s Homeless Services Authority at first declined to fund All Saints'. "Originally, we had to turn it down because they had suggested using pews which didn't fall within some of the compliance measures that we have to abide by in approving places," said LAHSA spokeswoman Naomi Goldman. People could easily fall out of the pews, the agency argued. 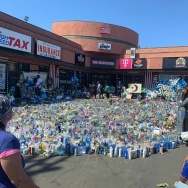 But Goldman said the agency changed its mind last week, at the urging of the area's City Councilmember Gil Cedillo, because of the "great need this winter season." Neighborhood activist Monica Alcaraz said it has been a slog to convince city leaders that the church shelter warrants the funding it needs for staffing, food and utilities. "Why does it matter if they’re sleeping in pews?" Alcaraz said of critics. "They rather (homeless people) sleep outside on the cold and when it rains?" Pets are allowed at the shelter at All Saints'. Alcaraz helped the nonprofit Recycled Resources set up the shelter at the church, with the backing of the priest, W. Clarke Prescott. Normally, organizers file an application with the city’s housing department. The city council notifies neighbors and holds a public hearing. But Alcarez says they skipped all those steps. She said northeast L.A.--like many areas of the city--doesn’t have a single homeless shelter, and needs one now more than ever. 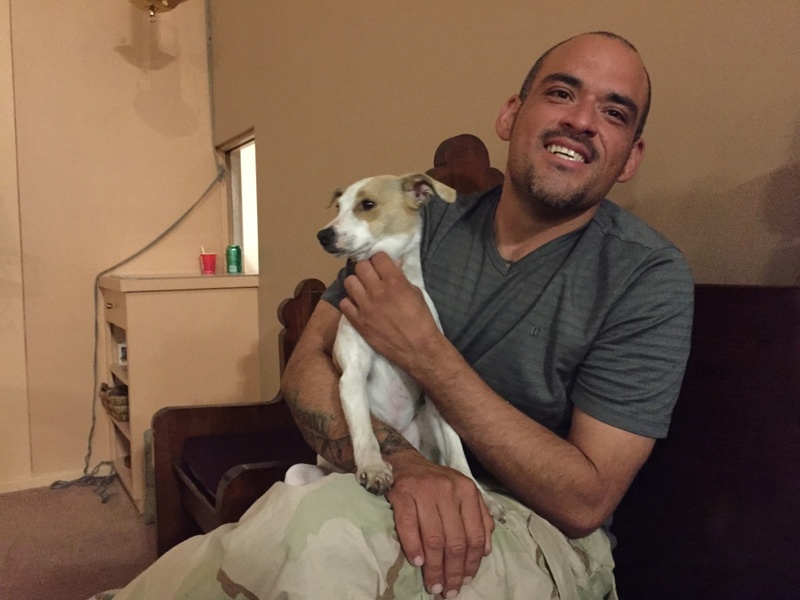 "Some of the people here have said, 'I’ve gone to Skid Row and I’ve gotten beat up I’ve gotten mugged," Alcaraz said. "They’re from this community. A lot of the people I’ve seen on and off since I was little." Even though it’s bypassed the rules, the shelter’s been allowed to operate. Some politicians have even praised the shelter. Councilmember Jose Huizar, who is co-chairing the council's homelessness panel, announced he's dedicate $20,000 of his district's funds toward the operation of All Saints'. He called Recycled Resources "an incredible partner in Northeast Los Angeles." But the city’s priority in recent years has not been on shelters but on getting people into long-term housing. The idea is that shelters are a temporary solution instead of a long term strategy. And that only after securing a place to live can people focus on sobering up or getting help for mental illness. This month, the council, backed by L.A. Mayor Eric Garcetti, approved $12 million for housing homeless people, mostly through vouchers. 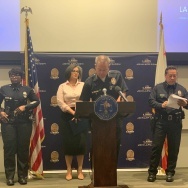 "Vouchers that somebody can take to any apartment or even to some motels for a year seems to be better than saying hey, we’re going to open up an armory or a shelter," Garcetti said. Garcetti said he recognizes the concern about getting people off the street when El Nino arrives. But he said the city is prepared. "I’m confident that whether it’s through our Parks and Rec facilities or looking at some of the schools, if it’s flooding, and we need to get people off the streets in an emergency, there’s space.” Garcetti said. But advocates for the homeless doubt there will be enough space for all, and say the city is moving too slowly. "Mayor Garcetti should learn from Katrina," said Mel Tillekeratne, who helps lead a coalition of non-profits called the Alliance to Solve Homelessness in L.A. "We can’t wait until the end." According to Tillekeratne, it’s going to take years and billions of dollars to build enough permanent housing for all of L.A.’s homeless. LAHSA is close to finalizing a $60,000-plus contract with Ascencia, a Glendale-based homeless services provider, to staff the shelter through March, said Ascencia's director of operations Vicken Sosikian. But he added there will still be a funding gap. "A good amount of expenses are not funded by LASHA and that is primarily food, supplies, maintenance, repairs," Sosikian said. For those costs, organizers at All Saints' say will rely have to rely on donations like the one from Huizar's office, and from locals - everybody from Girl Scouts wanting to cook the residents hot meals to comics who donated proceeds from a night of comedy to the shelter. Comedian Maria Bamford, who lives in neighboring Eagle Rock, headlined the fundraiser and this week came by the church with other comics to entertain the residents. 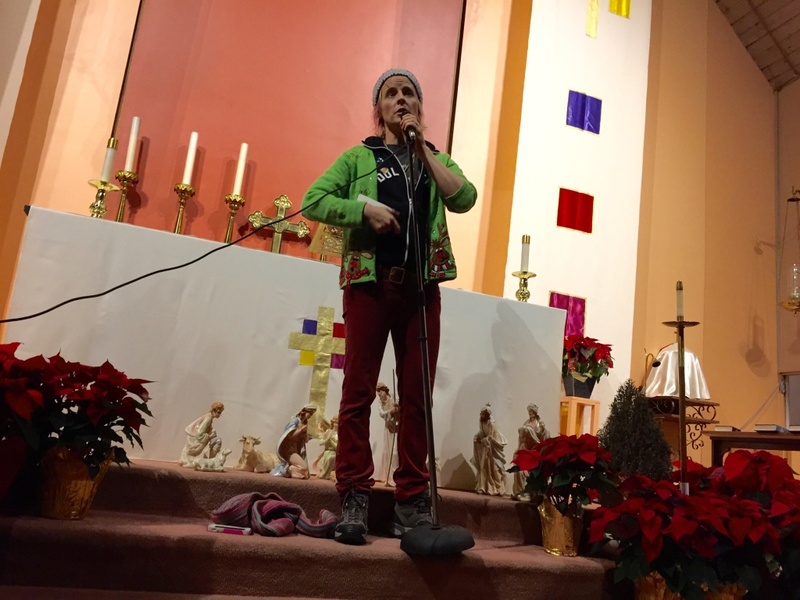 Comic Maria Bamford performs for the shelter residents at All Saints'. Sitting in her pew toward the back of the church, Roxanne, who didn't want to give her last name, laughed loudly at Bamford's act. She said she'd never thought she’d be watching stand-up in a church. "And I never thought I’d be homeless either," Roxanne, 58, said. "But here we are." She had spent a few months living outdoors in Altadena with her grown son when they found out All Saints' could take them through March. "I was just floored," she said. "So now I can make plans about saving money and building a future again." She just landed a job at a crafts store in Pasadena. Now, at the end of the work day, she’s got a church pew she can call home.